Jordan Brand is living up to all the hype in the first two months of this year. 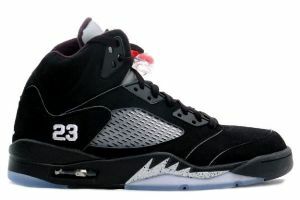 And as promised, they are going to make waves this 2011, and the new edition of the Air Jordan 5 Retro is a testament to the fulfillment of their goals this year. Already making waves in its first three days in the market, the Black/Black-Metallic Silver edition of the Air Jordan 5 Retro is a must buy this month. Why? Because it is arguably one of the best ever edition of the famous Jordan shoe model. The new edition features an all-black upper enhanced with lace locks and clear outsoles, plus the unique look of the “Number 23” logo. Can’t get enough of it? So what are you waiting for, grab one while it’s hot! Air Jordan 3 Retro OUT Today!